Sounds kind of silly–training a young gun dog to hunt. But, given that many of our bird dogs are city-slickers and from a variety of pedigrees, it’s becoming more obvious to me that you need to teach your pup how to hunt–to work cover. That is, if you intend to actually hunt over your bird dog and/or compete in AKC Performance events such as hunting tests and field trials (or the like–NAVHDA, NASTRA). Nope–they don’t “just come out of the box” with all of the skills needed to hunt upland game. Yes, some will have stronger instincts than others but most will need help to kick the instincts they do have into gear. Used to be, once upon a time when hunting land was more plentiful, you could just go for a walk with your baby bird dog. These walks would introduce the pup to thick, ungroomed cover. The cover held all sorts of interesting scent…which taught the pup how to use her nose. And, when game was actually flushed out of the cover, the pup would begin to learn where to search for game. Alas, much upland hunting land in the greater metro area is now developed and those convenient, daily walks are a thing of the past. http://www.fusionvizslas.com/a_vizsla_to_hunt_with.html). You don’t need to put birds out for your pups when doing this particular exercise…just take them for big long walks through the training/hunting fields (be mindful of the shooting that’s happening around you). The owners of the establishment should be supportive that you have a puppy and want to just start exposing him to a variety of cover. The other bonus to walking through the fields at a local gun dog club is all of the bird scent–your pup will get big nosefuls of different game birds. Pheasant, chukar, quail. Another tip when you’re taking these walks with your pup: Don’t talk to him. Just shut up and enjoy the walk. If your pups sticks close, don’t try to encourage him to move away. Just ignore him. And, if he runs off to explore–EXCELLENT! Don’t call him back in. If you can, try walking the field so you’re using the wind…just as you would if you were hunting. And, walk toward objectives that are likely to hold birds. If you know of a mature hunting dog who will tolerate your tag-a-long pup, schedule a walk every now and then with her. Be careful though–you don’t want to make a habit if your pup running along, trying to keep up with the big dogs. Doing so can cause injury/damage to your pup’s structure. You would never take your 6 year-old for a run with you, would you? There’s no way your child could keep up! Even if he could, would you risk an injury? Another bonus of taking these walks? Exercise. A tired puppy–both physically AND mentally tired, is a good puppy. Remember, your pup was bred to hunt for hours at a time, multiple days in a row. Pointing dogs are not designed to take daily leash walks though the neighborhood. Such walks wouldn’t even begin to take the edge off their energy levels. 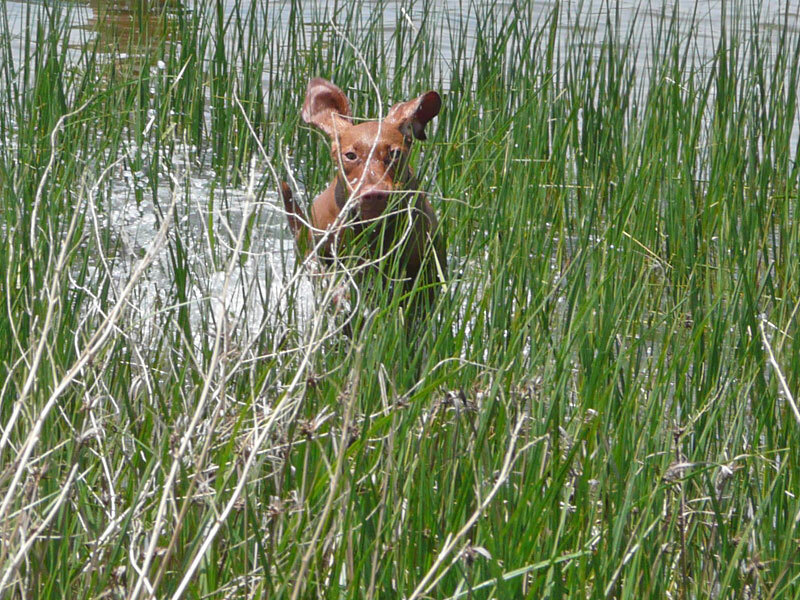 Pointing dogs, like Vizslas, were bred to hunt off leash. Aside from the physical activity of the actual running, the hunting challenges their minds and instincts. 4 month old puppy Trip bustin' through cover and LOVING it! Written by Mel Reveles and Aaron Davis of www.FusionVizslas.com. We are proud to be founding members of the Rocky Mountain Vizsla Club–“The Specialty Vizsla Club of Colorado”, and members of the Vizsla Club of America. We are also members of the American Kennel Club’s Breeder of Merit Program. Do Vizslas Make Good Family Dogs? What are AKC hunting tests and titles for pointing breeds?